Many people underestimate the unique athleticism required to swing a golf club properly. To dominate the golf course the next time you play, consider taking part in a series of golf swing exercises. 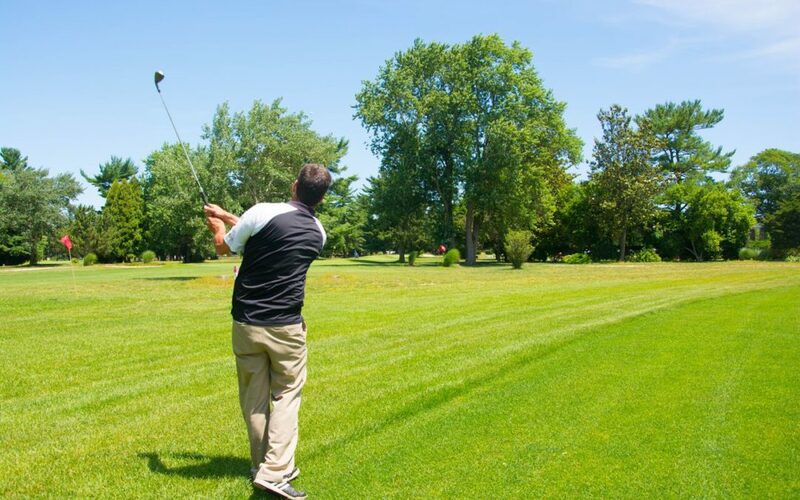 After all, if you plan on playing the Eastlyn Golf Course & the Greenview Inn’s par-62 18-hole course, you’ll want to be at the top of your game! This exercise incorporates every body part used during a golf swing. Put a resistance band beneath your left or right foot. Then, gently bend your knees while pulling the band to the opposite direction of your foot. After 10 repetitions, rest for about thirty seconds before switching sides. Try to perform two to three sets for each foot. This slight alteration of a classic workout will give you power and improve your range of motion. Begin by lunging to the left or right. Make sure that while one leg lunges the other is extended as far as comfortably possible. Alternate legs after 10 repetitions and perform two to three sets. This vintage exercise is used to increase the mobility of the hips and create a more powerful swing. Place your hands on your hips and take a big step forward. Make sure your front leg is at a 90-degree angle before lifting your back up and putting it in front of you. Three sets should be performed each with about 10 reps.
With a little practice, you can play your best the next time you hit the golf course. Visit us to participate in a tournament or just spend an afternoon playing casually. To book a local wedding venue or tee time, call us at (856) 691-5558.